More Americans are putting down Buds and Coors, instead grabbing wine, liquor, Corona and Michelob. Americans' changing drinking habits have been taking shape for years, but the trend accelerated in 2018. Beer shipments from US breweries are down 3.5% so far this year, according to The Beer Institute, an industry trade group. The big four US brands — Bud Light, Miller Lite, Coors Light, and Budweiser — have been hit particularly hard. What's wrong with Big American Beer? Drinkers think it's stale, compared to the innovative new brands and creative concepts emerging from craft breweries, vineyards and distilleries. "Well-established category leaders are finding it challenging to maintain their relevance against a backdrop with so much innovation and new brand activity," said Cowen analyst Vivien Azer. "You now see a much more promiscuous alcohol consumer." "We estimate that meals represent over 40% of total alcohol-appropriate occasions globally, though beer is underrepresented," Anheuser-Busch InBev (BUD) CEO Carlos Brito told analysts last month. American drinkers have found that beer doesn't go with everything. Instead of choosing beer for every alcohol occasion, more people are making their decisions based on social activities, Nielsen alcohol analysts say. AB InBev, the distributor of Budweiser, Bud Light, and Stella Artois, is trying to reposition its beers to fit the changing drinking environment. "Budweiser is the perfect beer for high-energy, premium party occasions," Brito said. Shifts in younger drinkers' preferences have upended the industry. Millennials have shown a tendency to experiment across categories, explained Eric Shepard, executive editor of trade publication Beer Marketer's Insights. Fewer people today say they exclusively drink beer or wine, and category lines are blurring, with the rise of flavored malt beverages, spiked seltzers, and exotic bourbon and whiskey wines, Nielsen analysts have found. Craft brews, once the bright spot in the US beer industry, are beginning to grow at a slower pace. "There's a certain saturation point that you reach in any kind of trend," said Robert Ottenstein, an analyst at Evercore ISI. "Not everybody is an experimenter." At a Stifel analyst conference earlier this month, outgoing Craft Brew Alliance (BREW) chief financial officer Joe Vanderstelt said that many craft lagers were not immune to drinkers replacing beer with wine and spirits. Craft Brew believes its Kona brand can continue to attract new drinkers. 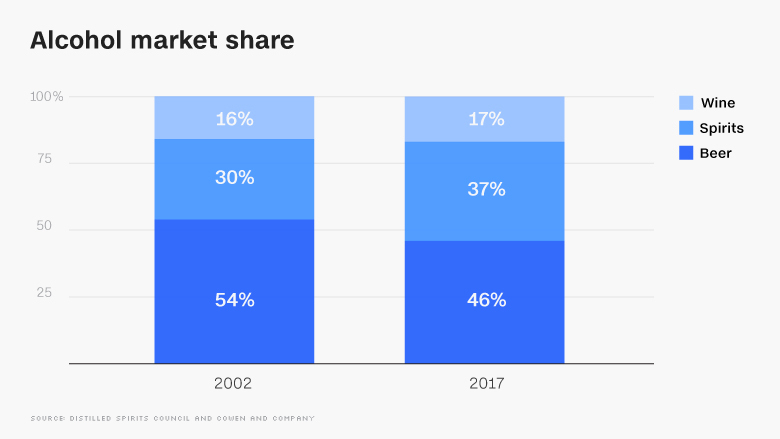 Wines and liquors — roses, proseccos, bourbons, whiskeys, tequilas, and cognacs — have recently taken advantage of the same phenomenons that led to the craft explosion, said Mimi Bonnett, an analyst at consumer research firm Mintel. "Most wines and spirits are also well positioned to leverage the nuances of 'craft' without much effort," she said. "They share many of the same traits: heritage, hand-craftsmanship, aged qualities, regionality, a sense of premium and, in some cases, small batch." Tito's Handmade Vodka has been a "blockbuster" over the past several years, Ottenstein said, while Jack Daniel's brands have led to a whiskey resurgence. "It was really the launch of Jack Daniel's Tennessee Honey that set the category on its growth cycle," Azer said. "Growth in wine and spirits has continued. 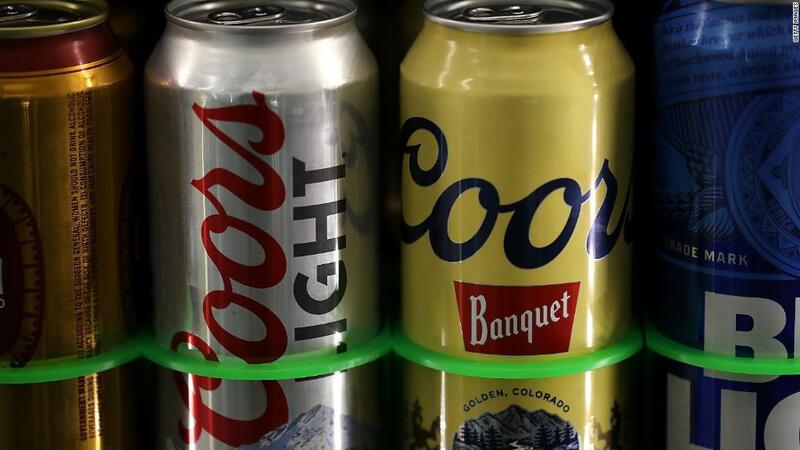 There's no doubt about that," MillerCoors CEO Gavin Hattersley said last month. 21- to 27-year old drinkers have drifted away from beer, Hattersley told analysts. MillerCoors' owner Molson Coors (TAP) reported a 3.8% loss of volume in the United States last quarter. The weak results drove its stock to a four-year low. AB InBev reported a 4.1% decline in North America. The most recent quarter was another mark in the steady decline of beer's popularity and the erosion of AB InBev and Molson Coors' market share. Since 2002, beer's share of the alcohol market has fallen to 46% from 54%, according to Cowen. Wine has jumped to 37% from 30%, while spirits have ticked up to 17% from 16%. Americans are still drinking beer -- just better beer. The premium end of the market is growing faster than the bottom portion. "There's a huge shift toward higher end beer," Ottenstein said. Constellation Brands (STZ), the Mexican-based distributor of Corona, Modelo and Pacifico, has capitalized on Americans' love for imported lagers. Shipments from Mexico, the largest beer exporter to the United States, were up 9.5% through May, the Commerce Department said. Premier will take on Michelob Ultra, a low-carb light beer that has been one of the most successful beers for AB InBev. It has grown its share for three straight years by appealing as a "lifestyle" beer for more affluent, active drinkers.